Young, middle class most effected The rate rises will have the most impact on young, middle class families, the authors conclude. Realty One Group, an established U.S. real estate brand, is aiming to expand aggressively across Western Canada. Shami Sandhu, formerly broker at Re/Max River City in Edmonton, has secured the rights to Realty One Group of Western Canada and plans to expand the brand to as many markets as possible in Manitoba, Saskatchewan, Alberta and British Columbia. “We’re willing to look at every market out there. I’ve recently been contacted from markets like Wetaskiwin and Leduc (in Alberta). I’ve had people contact me from Nanaimo, Fort McMurray and Brandon, Man.,” says Sandhu. He says interest in the brokerage is very strong from two main groups – independent brokerages that see the value of affiliating with Realty One Group to grow their business, and real estate teams, who are now looking at taking their business to the next level by starting up a brokerage. Sandhu has over 15 years of industry experience and was previously awarded Broker/Owner of the Year by Re/Max of Western Canada. Sandhu says no one has disrupted the Canadian real estate market in 35 years but it’s time for a new disruptor. “I believe Realty One Group will be very well received just like they have proven to be in the U.S. I want to show the Canadian real estate industry what we need and to remind them that it’s our agents that truly drive this business and the focus needs to be on them,” he says. Sandhu says what differentiates Realty One is that it’s a 100 per cent company, meaning that its agents don’t pay a commission split. They pay a flat fee monthly or a flat fee per transaction. “Where we’re different from the other companies in Canada, especially, is two main areas. One is corporate culture. Our organization is all about everyone having a voice. Everyone’s an equal participant in our organization. The agents are finding out what’s happening with the company the same time the broker owners are. They’re encouraged to provide feedback to the company,” says Sandhu. “We’ve been described as being very Silicon Valley, Google-esque in a way in our approach. Another key point about the brand, says Sandhu, is the level of support it provides agents through tools and resources. Realty One Group was founded in 2005 in the U.S. by owner and CEO Kuba Jewgieniew, a former stockbroker. Two major demographics are mainly responsible for the current strength of the Canadian luxury condo sector, according to the 2018 RE/MAX Spotlight on Luxury Report. “We’re also seeing an emerging trend of Millennials entering the lower end of the luxury condo market, as they tap into their inheritance to invest in this popular property segment,” he stated. Toronto and Vancouver condos priced at $1-2 million price range have sustained its healthy share of buyers over the past few years. Toronto luxury sales rose by 2% year-over-year, while Vancouver had a 6% increase. “Local buyers are driving demand for luxury condos going into 2019, which is welcome news for developers in major city centres looking to build more properties,” RE/MAX of Western Canada executive vice president Elton Ash said, adding that overseas investors are shying away from the single-detached sector. Luxury single-detached sales went down by 37% year-over-year in Toronto, and 31% in Vancouver. 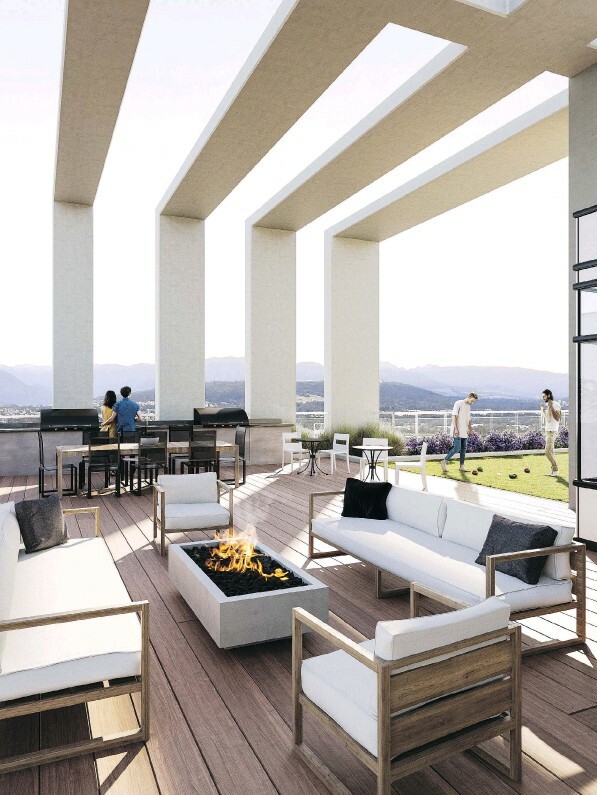 Ovation is a project in development from Domus Homes in New Westminster that will feature a luxurious common area on the 32nd floor for all tenants to enjoy. 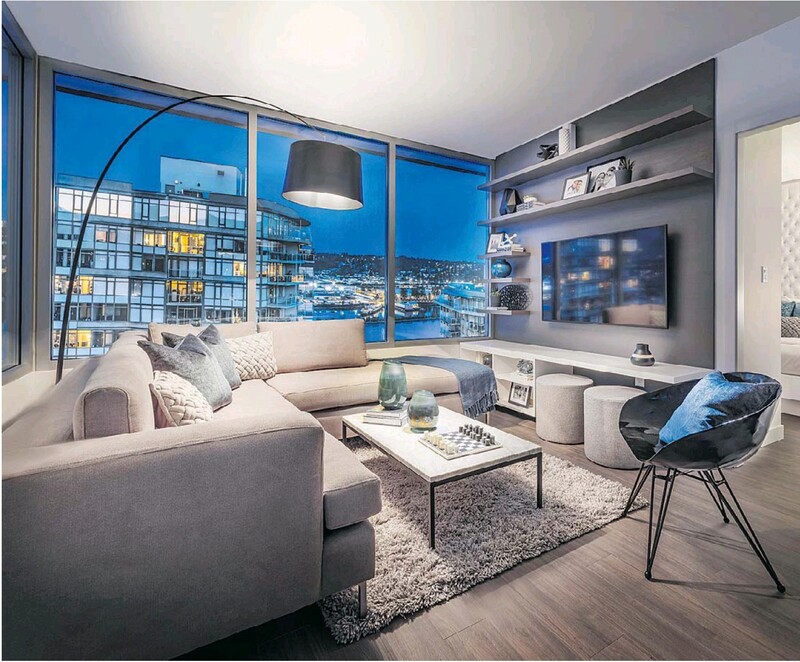 The Ovation, a 32-storey development in New Westminster, is designed to take advantage of the wonderful views and offers a sophisticated interior design that feels cosy at the same time. 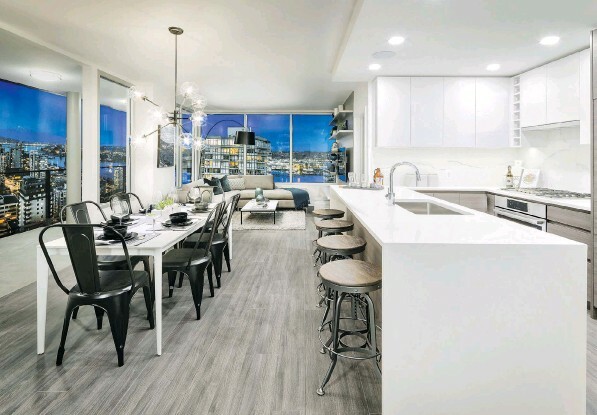 In a nod to New Westminster’s arts and cultural community, Domus Homes is setting the stage for plenty of applause with Ovation, its new 32-storey development in the city’s historic downtown. One of the development’s showstoppers is expected to be the amenity level on the 32nd floor. Half the space is dedicated to indoor amenities, including a sky lounge, fitness zone, chef’s kitchen and dining room, while the other half comprises outdoor amenities that include a hot tub, bocce court and a large outdoor lounge and barbecue area, says Richard Wittstock, principal at Domus Homes. “The concept is to enable everybody in the building to enjoy the spectacular views from the top of the building. There are 360-degree views of the [Fraser] river, mountains and bridges. New Westminster is really known for having amazing views and we wanted to make that available to everybody – from the people who buy the least expensive suite to the most expensive suite,” he says. The site will also accommodate a small rental building for seniors who have worked in the performing arts and related industries. This building is the result of a partnership with Performing Arts Lodges (PAL) Vancouver to build a 66-unit seniors’ rental building, PAL New Westminster. Ovation will be situated at 813 Carnarvon Street, close to the New Westminster SkyTrain station and surrounding shops, the Columbia Square Mall and the New Westminster Quay, and Wittstock believes the location is a major advantage. “We started with an incredible location and then, working with GBL Architects, we think we’ve created something really special,” he says. “The building’s architecture features vertical and horizontal elements working together. Ribbons of concrete and metal stretch up the building and then over the roof and back down,” he says. The southwest corner of the site receives the most natural sunlight, Wittstock says, and to enhance the Carnarvon Street streetscape, the plan includes a wide sidewalk and ground-floor retail and restaurant space that will include outdoor seating. “From there, we’re also creating a sidewalk that connects up to the park behind our site. The park is being rebuilt to commemorate the original New Westminster Chinatown in this area,” he adds. The 204 units planned for the tower will include one-, two- and three-bedroom homes and two-level city homes, ranging in size from 482 to 1,344 square feet. The interior design, by Cristina Oberti Interior Design, features two colour palettes, Light and Dark. The Dark palette, presented in the two-bedroom show suite at the sales centre at 1001 Columbia Street, is the bolder option, Oberti says. 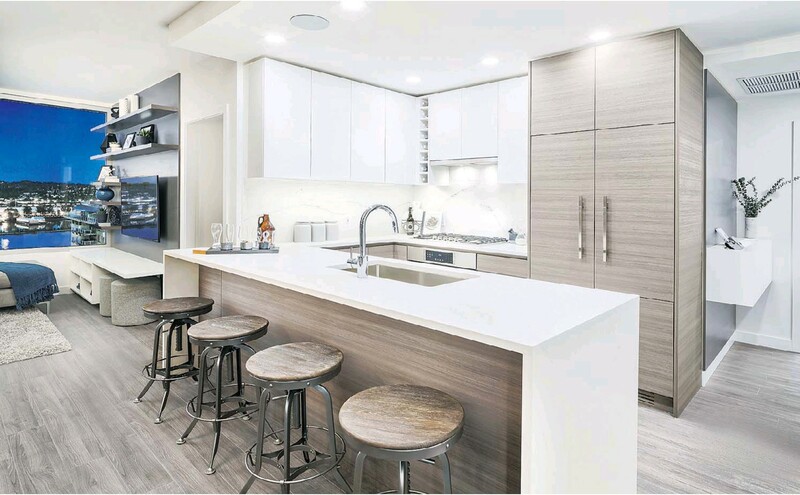 In this scheme, the kitchen features two cabinet door finishes: the lower cabinets are in a dark grey wood finish, while the upper cabinets have a high-gloss white lacquer finish. “The combination adds contrast while also brightening up the space. It gives the kitchen a graphic punch,” she says. In the kitchen at the sales centre, the large three- by nine-foot peninsula – with a waterfall edge – shows the pure white quartz countertop. It also accommodates the undermount stainless steel sink and chrome Grohe faucet that add a little sparkle to the space. The major appliances include a five-burner 30-inch Bosch gas cooktop with a slide-out range hood and a large-capacity Bosch wall oven. The 36-inch Fisher & Paykel refrigerator with french doors is integrated, as is the Bosch dishwasher. The sales centre also features a second kitchen based on a one-bedroom unit. Showing the Light palette, this kitchen has a 24-inch Bosch gas cooktop and a 24-inch single-door Blomberg refrigerator. The large island in this vignette doubles as a dining space with one end free of cabinetry to accommodate seating while the other end contains a Bosch dishwasher. Both the Light and the Dark schemes feature full-height kitchen backsplashes in a marble finish. “I personally always love a full-height kitchen backsplash. The marble finish gives the kitchens a very sophisticated and modern look,” Oberti says. In the ensuite bathroom, the white quartz countertop and the continuous surface of marble-look 24- by 12-inch porcelain tiles on the floor and walls (including the shower with its glass enclosure) give the space a fresh and spa-like ambience. In the main bathroom, the countertop is a grey quartz while the dark grey floor tile complements the dark wood cabinetry. White 24- by 6-inch wall tiles provide the contrast. Wittstock says Ovation has attracted a lot of interest from a range of buyers, including many first-time buyers. “We think the two-bedroom homes will appeal to young professionals and the city homes are going to appeal to the families, while the sky homes will appeal to downsizers and professional couples,” he says. Most units include a parking space in the four levels of underground parking. The development also offers Modo Co-op care-share benefits, including two Modo vehicles and parking stalls. CMHC has published its latest Housing Market Assessment and says that even in four markets where overvaluation is detected – Vancouver, Toronto, Victoria, and Hamilton – house prices are returning to levels that are supported by housing market fundamentals such as income, mortgage rates, and population. The highlights Nationally, the moderate rating of overvaluation is maintained, as a longer period of improved alignment between house prices and fundamentals is required for overvaluation to be deemed low. The roller coaster of marketing ideas continues to take over the real estate industry. As we search for new ways to get business, it seems that the easy answer is to spend money on a technology-based tool – such as a new website, social media, chatbots or any type of online advertising. Why? Because this new world of “lead gen” is what’s going to make the big difference in the amount of business you will do in a year. Or will it? It is said that most people know between one and five Realtors. Yet with that knowledge, Realtors are still spending their money chasing leads, also known as “strangers”. It is also said, and I can attest through my own research of bluntly asking the question hundreds, in fact probably thousands of times, that 90 per cent of Realtors get 70 to 90 per cent of their business from people who know, like and trust them. These same people who probably already are, and if not, definitely should be, on your contact list. 1. Recognize where your business comes from and whether this new tool is best suited to connect with that audience. For example, if all of your business is coming from people you know, why spend a whole bunch of money advertising to people you don’t know? Instead, do an even better job of marketing to the people you do know and have a diligent process to ensure you’re keeping your database up to date at all times. This database is your gold mine. Even any new people you meet from any source should always be going into this list. Work it the right way, make more money. That is your goal every day. 2. Analyze your marketing budget and determine if you’re focusing at least 70 to 90 per cent of it on the audience who delivers 70 to 90 per cent of your income. Ask yourself whether you can afford to try this new bright shiny tool for the amount of money it costs, and the amount of time it will take to convert this new lead. Just spending the money to get the lead is not enough, you need to plan and budget to market to these people during the “conversion” process, and you need to do the same during the pre and post “nurturing process”. If you get repeat and referral business from your list, then if you do get this new lead and you do convert them into a client, you will need to budget to market to them after the fact as well. 3. Recognize that relationships take time to build. When meeting someone who may be this new “online lead”, your goal is always to develop the know you, like you, trust you factor before trying to lock anyone into a contract. Think about it. You’re not the only person who got that “new lead” from that exact same person (lead). So why should they choose you? Just because you got their info online? Why not the other salesperson who also got their information? The key is to develop the relationship so they like you more. That’s where business comes from. So, it’s up to you to get past the tech and get involved. That will make all the difference in the world. The process for obtaining a client is the same as it has always been. Tech can help but cannot be the only tool you use. Remember, once you get the deal, you now have a relationship, you are now both real people. Online is no longer enough. Although technology has given us new tools, and it has helped speed the process for many aspects of the business, has this business really changed? It is still and always will be a people business. Technology is helpful, but it can be expensive, and more time consuming than imagined. Stop making yourself work so much harder than you should because you decided to spend more money than you should. Focus on the right audience, deliver the right message across the right channel, remember that this is and always will be a people business. Don’t get caught in the hype without proper planning and budgeting. Be smarter. You will spend less, work easier and make more. Household debt is a concern Although the economy is moving in the right direction, the BoC remains concerned about Canadian oil prices, especially with constrained pipeline capacity. You are currently browsing the Les Twarog Vancouver Real Estate and Condo Blog blog archives for October, 2018.